Great CAS card and perfect for a male. Ooh, I like this, Ardyth! I like the kraft layer, it lets the sentiment banner really stand out. I'm going to have to look at your inspiration board more often...lots of great stuff on there!!! Another WOW creation! I agree with Melissa...this is the perfect guy card! 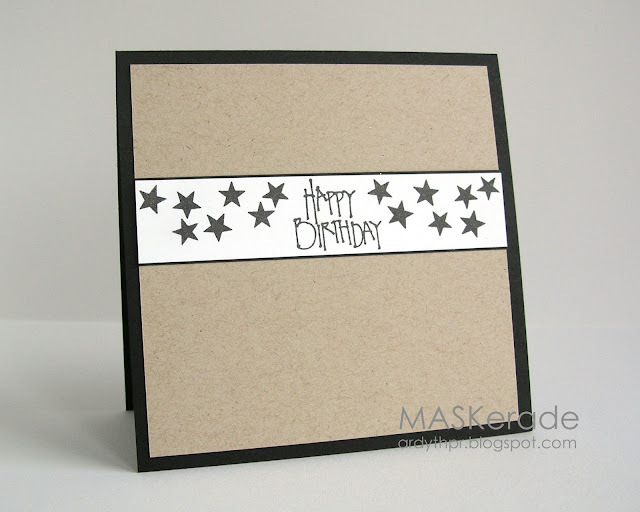 The kraft cardstock really gives the card as mascualine feel (something about guys andearthy colors). The black border IS perfect! Great card! This super-CAS creation is awesome! And I agree, it's always handy to have a few masculine cards on hand. Perfect masculine card! Well, perfect card, really!